Since a devastating football injury, Chris Norton has taken steady steps toward recovery through determination, faith and a strong support network. Now, he's reaching out to help others with spinal-cord injuries. On a Saturday, Oct. 16, 2010, while making a tackle in a Luther College football game, Chris Norton's life changed dramatically. It was clear right away that his injury was serious. On the field, he told coaches and trainers he couldn’t move, and he couldn't feel anything below his neck. Chris was transported to Winneshiek Medical Center in Decorah, Iowa, and from there, flown by helicopter to Mayo Clinic in Rochester, Minn.
Physicians found that Chris had two broken vertebrae in his neck and compressed spinal cord. Initially, he had no movement from the neck down. But within 24 hours of the accident, there was a sign of hope. Chris was able to move his shoulder. That was below the injury site, and Chris and his family latched onto that sign. In the midst of a crisis, the Nortons were buoyed by faith, family and friends — and Mayo Clinic staff members who reached out to them with compassion. “The staff were so encouraging and kind,” says Terry Norton, Chris' dad. “When you are in such a vulnerable position . . . you analyze every word, every look.” Among the words that gave them hope were those of a nurse who early on said, “I’ve been here long enough to know classifications can change. He will get better." A month after his injury, Chris asked to increase his therapy sessions. Nine days later, on Thanksgiving, he moved one of his toes for the first time. The significance of that movement, distant from the site of his injury, was lost on no one. “That was a big day,” Chris remembers. Other big days followed. In early December, he lifted one of his legs. By the middle of the month, he began to brush his teeth and feed himself, and by the end of the month, he had walked five feet with help from his therapists. Over his seven months of rehab at Saint Marys Hospital, Chris developed a special bond with those therapists. Maybe the best testament you can have as a health care worker is a patient telling you -- and anyone else who will listen -- that after a seven-month stint of hospitalization and rehabilitation, he'll be sad to leave you. That was the message Chris Norton shared as he and his family headed home to Iowa and on to the next step in his recovery. More big milestones would follow. In August 2011, less than a year after his injury, he returned to Luther College to continue his studies. And one month later, he led his football team onto the field as an honorary captain and stood with his co-captains for the national anthem, one of the first times he'd stood in public, with limited support. In November 2012, Chris was honored as winner of the America's Choice Honor for Courage in Sports. He was featured on the CBS Early Show and in "Courage in Sports," a one-hour CBS Sports special. It was a big week for the Norton family. As he got ready for his close-up, he shared his story in a video featured on the "Courage in Sports" program. These days, Chris is back to his studies as a junior at Luther College, and continues to spend three to seven hours a day on his rehabilitation work. He also started a foundation -- The SCI CAN Project -- to help others with spinal-cord injuries who don't have access to the kind of rehabilitation team and equipment that he credits for his progress. The foundation's first event is Sunday, Sept. 30. The Decorah Tour starts at 1 p.m. at Winneshiek Medical Center and is an opportunity for people of all ages to experience Decorah's recently upgraded network of trails -- by foot, wheelchair or bike (at the speed of your choice). 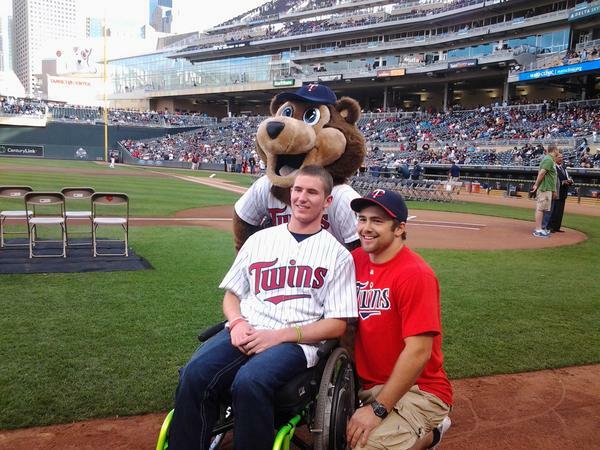 Earlier this month, Chris was once again in the spotlight, throwing out the ceremonial first pitch at Target field prior to the Minnesota Twins baseball game. You can see video of Chris' first pitch below.